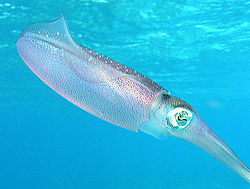 Squids are a major group of Cephalopods, which also includes the octopus and the cuttlefish. They have a distinct head, bilateral symmetry, a mantle, and tentacles with suckers. They also have two hearts, gills, and an ink sac. Squid also have eight arms and two tentacles arrange in pairs. These are a type of muscular hydrostat. When cut off, the squids arms do not grow back. Squids can also hide from predators by blending in with there surrounding. They also have some of the largest eyes (in proportion to body size) of the animal kingdom. Also being a coleoid means they have a single flat bone plate buried within the soft tissue inside their head. Squids also have a specialized foot called a siphon, or a hyponome, that enables them to move by expelling pressurized water out the siphon. The mouth of the squid is has a sharp horny beak made of chitin (a nitrogenous polysaccharide). This is used to kill and tear prey into smaller edible pieces. The beak is the only indigestible part of the squid. The mouth has a radula (the rough tongue all mollusks except bivalvia and aplacophora have). Most squid live in the deep sea, but the young squid live in the shallower waters. Squid is a marine delicacy to the whale. The squid does not go easy when being attacked by a whale, and they put up a good fight by cutting the whale with their beak. For the most part we do not really know where giant squid live other then in the deep ocean. Squid is considered a delicacy in many part of the world. Humans eat up to 5000 tons a year in Australia. Few ways we eat squid are fry them, grill them, and boiled. This page was last modified on 24 July 2014, at 17:23.